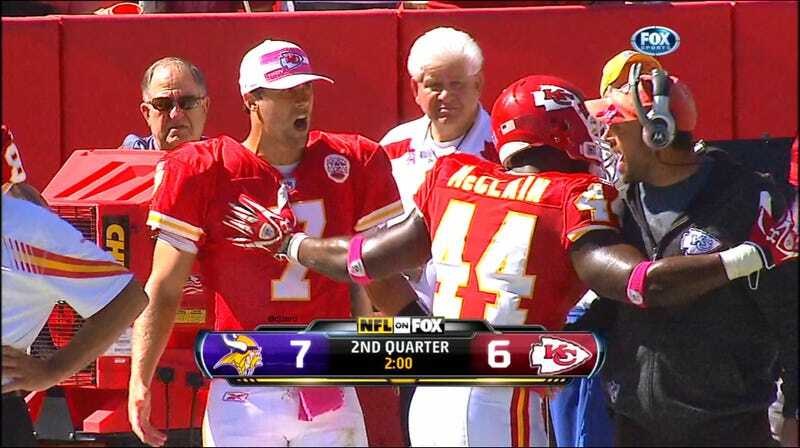 Tempers flared in Kansas City as Todd Haley continues to prove that he is who we thought he was. The legend of Megatron grows and the end of the undefeated era in the AFC. All these stories and more, below. Detroit 34, Dallas 30: I wouldn't know, but it sure sounds like Detroit is an awfully exciting team to watch. I might have to reschedule my Thanksgiving Day nap. Chicago 34, Carolina 29: Devin Hester now holds the NFL record for punt and kickoff returns for touchdowns. Steve Smith became Carolina's all time leading receiver and Cam Newton had another big statistical day. He's a winner. Except when he's not. Cincinnati 23, Buffalo 20: Despite a second consecutive game with a pick-six, the unstoppable juggernaut has been defeated. It took a Mike Nugent (Yes, the same Mike Nugent drafted in the second round by the New York Jets) field goal in the final seconds to break the tie and win the game. Chan Gailey even did the ol' Call A Timeout As The Kicker Is About To Kick routine. No dice. Tennessee 31, Cleveland 13: Hey, Chris Johnson! Good to see you. What's up Matt Hasselbeck? You seen Peyton Hillis? Nah? Ok, it's cool. Catch you guys later. Kansas City 22, Minnesota 17: The Chiefs got their first victory of the season while the Vikings get to try again next week. The big story though, was the argument between Todd Haley and Matt Cassel. Both Cassel and Haley had to be restrained from what we can only assume was a heated argument on whether OAR is actually better than Dave Mathews Band. Washington 17, St. Louis 10: The Redskins held the Rams to 172 total yards in a game that I am sure was exactly as exciting as it sounds. New Orleans 23, Jacksonville 10: There's a lot to take from this game, but perhaps most striking is this: The Jaguars have score 39 points this season. Houston 17, Pittsburgh 10: Houston tried like mad to give this one away. The Texans had 14 points and plenty of other big plays wiped out thanks to penalties. In the good news/bad news department: Arian Foster had a huge game as Andre Johnson left early with a hamstring injury. San Francisco 24, Philadelphia 23 The Eagles looked to get The Ground in on the action early today. Unfortunately, Ronnie Brown and The Ground were unable to connect. To add insult to injury, the pass was ruled a fumble and San Francisco recovered. What a nightmare! Funny Tacklin' is sponsored this week by Tony Sparano. Philip Rivers-who one of these days will forget to release the ball at the end of his motion and wind up throwing himself fifty yards-was able to find a wide open Vincent Jackson downfield for what would eventually be a touchdown, thanks to some funny tacklin'. Jackson was able to withstand the first attempted take down by a combination of himself, the ground and Rivers. Undeterred, he shook it off and shot back up, his sights set on the endzone. "Not so fast" said Reshad Jones, as he slid down Jackson. "I will slow you down, but I will not stop you." NY Giants 31, Arizona 27 The real losers in this game were our eyes. Sweet Jesus, those Arizona uniforms are hideous. There was a controversial play/call at the end involving Victor Cruz, who was deemed to have "given himself up" following a catch where it looked like he stumbled and then dropped the ball, thinking he was down. Accordingly, Arizona's fumble recovery was not a fumble recovery and the decision not reviewable. Silver lining: It afforded FOX the opportunity to do the one thing it does well and consult with Mike Pereira. He thought it was a bad interpretation. Atlanta 30, Seattle 28: Tarvaris Jackson had three touchdowns, but he was no match for Mattural Ice and the Falcons. Still, 28 points to the Seahawks; that's a lot of points to give up to a team with a quarterback even the Vikings didn't want. San Diego 26, Miami 16: Chad Henne left on the Miami's second possession with a shoulder injury. They would never recover. How do you feel about booing him now, phins fans? His injury probably directly lead to this loss. Or, maybe the Dolphins are terrible. Tough call. New England 31, Oakland 19: Total blowout, just like I predicted. Tom Brady was a Mark Sanchezian 16-30 for 226 yards and two touchdowns. So, he will probably still be pissed going into the Jets game. Green Bay 49, Denver 23: This is the point in the movie when someone opens the door to the Fantasy Football Scoring Center and we see a smoke-filled room of men in white shirts and black ties writing with pencils so quickly that they are igniting the sheets of paper being marked up. Fictional Character Associated With the Region Game Simulator Results Show FCAWRGS is credited with a win because a) It correctly predicted that Houston would not lose, and b) I make the FCAWRGS rules.